Formal agricultural research has generated vast amounts of knowledge on land management and made recommendations for farmers. However, adoption of relevant practices has been low, largely due to the traditional extension approach used to engage farmers. An innovative approach to extension, the rural resource centre (RRC), offers a solution to this problem. 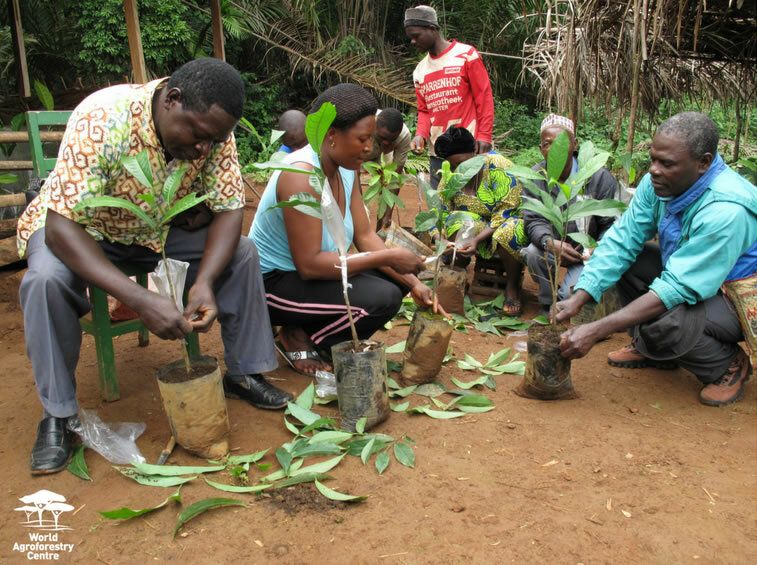 The World Agroforestry Centre (ICRAF) has been developing rural resource centres since 2006; first in Cameroon, and later in Burkina Faso, the Democratic Republic of Congo, Mali and Niger. Rural resource centres are training and demonstration hubs that are managed by grassroots organizations and often operate outside the formal extension model. They create opportunities for farmers to share experiences and to receive technical guidance and services that are tailored to their livelihood needs. Emphasis is put on access to knowledge, interactive learning and networking among farmers, and between farmers and other actors. Farmers are encouraged to learn how to conduct their own testing, adopt successful technologies, and extend them to their fellow farmers. A ‘typical’ RRC comprises a tree nursery, demonstration plots, a training hall, a small library and office space. Accommodation, catering facilities and agricultural processing units may also be part of the RRC depending on available resources, opportunities and needs. In Cameroon, ICRAF and local partners have helped communities establish 10 RRCs, hosting 150 nurseries and serving over 10,000 households. One of these RRCs, Riba Agroforestry Resource Centre, which is dedicated to the promotion of sustainable tree-based farming and soil fertility restoration with the objective of improving local incomes, enhancing gender equity, and improving agricultural practices, won the prestigious UNDP Equator Prize in 2010. Riba Agroforestry Resource Centre is 2017’s winner of the National Energy Globe Award Cameroon! The Energy Globe Award, which is described as “the Oscar of the environment”, is today’s most prestigious environmental award and presents successful sustainable projects to a broad audience to emphasize that many of our environmental problems already have good, feasible solutions. It is awarded annually to projects which focus on energy efficiency, renewable energies and the conservation of resources. This year, there were over 2000 submissions from 178 countries.